Nordic Bet offers gaming services to its patrons, including Sports, Casino, and Poker rooms. As a convenience to its players, Nordic Bet offers a shared wallet between its Casino and Sports rooms. With a shared wallet system, players can transfer money between two rooms (for example, you can switch between Casino and Sports rooms and play from the same digital wallet). For the Poker room, Nordic Bet uses a single wallet system, meaning funds cannot be transferred from the Poker room to another account. 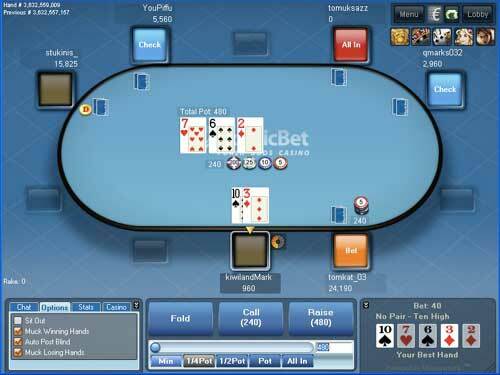 NUTS: With two bonuses to choose from, you can tailor a bonus to your style of poker playing. The €25 Instant Bonus is insanely easy to clear. BEATS: The €1,000 Bonus requires you to clear €2,140 in rake within 60 days. That’s a big effort, if you only play at low to medium stakes like most players. Use the Nordic Bet Poker Bonus Code POKER1000 when you make your first deposit to activate the bonus described below. For the Poker room, Nordic Bet offers two deposit bonuses. The first is the €25 Instant Bonus, using code “POKER25”, and the second is a €1,000 Bonus, using the code “POKER1000”. The €25 Instant Bonus is a 50% offer for new players: sign up with €50, get €25. To unlock your bonus, you need to earn 15 Poker Points per €1 of bonus. €1 in rake = approximately 7 poker points, meaning you will need to play through approximately €50 in rake to unlock the bonus. The bonus expires in 60 days, if you have not met the playthrough requirements by then. The second bonus, where to receive €1,000, requires a minimum deposit of €100. Within 60 days, play through 15,000 poker points, which is approximately €2,140 in rake, and you will receive €1,000 in your account. Both bonuses give your accounts 30% rakeback status. This bonus gives you 30% of every €1 raked on Monday, provided a minimum of €30 has been raked the previous week. The €25 Instant Bonus for the Poker room rates as a 5 out of 5. To play through €50 in rake is not difficult and how long it takes depends entirely on what stakes you play. Though the payoff is only €25, this is a very easy bonus to clear. The €1,000 Bonus for the Poker room rates as a 3. To play through €2,140 in rake takes a lot of time and, again depending on your stakes, could take a significant bank roll. This bonus could be rated a 5, except for the 60 day time limit. Because of this time limit, all but the most dedicated players will likely miss out on achieving the requirements necessary to gain this bonus. NUTS: An extra €100 in your account is never a bad thing. BEATS: But the bonus requires you to bet €3,500 before the €100 bonus is unlocked. Use the Nordic Bet Casino Bonus Code NB100 when you make your first deposit to activate the bonus described below. This means that every wager at slots and most games will count as one wager. However, if you play at Let it Ride, each wager will only count as half a wager. If you deposit €100 and receive €100 as your 100% bonus, you will have to wager €3,500 before you can access your funds. Finally, if you have not met the playthrough requirement in 30 days, your bonus expires. The Casino bonus rates as a 1 out of 5. Wagering €3,500 to gain €100, at any odds, is a losing proposition. NUTS: To clear the €100, you must wager €600. If you make smart wagers, odds of turning a profit are better than average. BEATS: The only downside to this bonus is if you’re not an avid sports bettor. Players without a deep knowledge of the sport they’re betting on may easily lose money on this bonus offer. Use the Nordic Bet Sportsbook Bonus Code SPORT100 when you make your first deposit to activate the bonus described below. Nordic Bet offers a variety of sign-up bonuses for new players. Earn a 100% deposit bonus up to €100 by using the code “SPORT100” when you sign-up in the Sports room. Your bonus will have just a few conditions. The offer is available only to new customers, and the received bonus must be wagered six times with odds 1.8 or higher before withdrawals can be made. Betting on more than one outcome of a match, in an attempt to gain quicker access to the funds, is not allowed. Finally, the bonus is only available to players from Denmark, Sweden, Finland, and Norway. On a scale of 1 to 5, with 1 being poor and 5 being excellent, the Sports bonus rates as a 4. You must wager €600 at 1.8 odds to get €100. To profit €100, you must wager 6 times your potential profit, at odds which prevent breaking even. If you have surefire inside knowledge on your favorite team, this might be the bonus for you. However, if you’re just getting started on sports betting, steer clear of this one. 400% up to €20 — Automatic bonus with our links! NUTS: A €20 bonus to get you started on bingo will get you into a lot of small ball bingo games. BEATS: You’ll have to wager your bonus 3 times, for a total of €60. But in a game like bingo, turning a profit on this bonus is far from impossible. There is no Nordic Bet Bingo Bonus Code to be entered, the bonus is Automatic with your first deposit. For the Bingo room, Nordic Bet offers a 400% deposit bonus up to €20. Deposit €5, and earn €20. There is no code required for this bonus; simply play €5 in bingo within 72 hours of singing up, and your account will receive the bonus. The €20 bonus must be wagered three times within 30 days, before it can be withdrawn. The bonus money can only be used on Bingo games.